Alan Roach is an American sports announcer and radio personality. He currently is the public address announcer for professional sports teams Minnesota Vikings, Colorado Avalanche, and Colorado Rapids. Roach is also the Voice of NFL Events worldwide and an announcer at 5 International Olympic Games. Alan Roach is the voice of the underground train system in Denver International Airport. Alan Roach's announcing credits include 8 Super Bowls, 5 Olympic Gold Medal Hockey games, and multiple allstar games for the National Football League, National Hockey League, and Major League Baseball. Alan Roach began his radio career as a high school student in Brainerd, Minnesota in 1982. His early radio career included numerous radio stops including Fort Dodge, IA and Des Moines, IA, Garden City, KS, and Colorado Springs, CO. In 1991, Alan landed in Denver, CO as afternoon host on KRFX radio. In 2000, Roach began as morning sports anchor on 850 KOA radio in Denver. In addition to daily sports reports on the station, Roach also served as pre-game host, sideline reporter, and post game interviewer for the Denver Broncos Radio Network, where KOA was the network's flagship station. In June 2015, Roach fell victim to corporate-owned radio's common practices, downsizing and budget cuts. Roach's first sports announcing job was as Public Address Announcer for the Colorado Springs Sky Sox in 1990. He was asked to fill in for the PA Announcer during a vacation. The former PA Announcer never got his job back. Since, Roach has become one of the most heard sports event public address announcers in the world. Roach handled public address announcing duties for Super Bowls from 2006 - 2013, starting with Super Bowl XL in Detroit through Super Bowl XLVII in New Orleans, Louisiana. Fans did not get to hear Alan's voice during the 2014 Super Bowl, as the NFL cited a potential competitive advantage for the Broncos having their regular P.A. Announcer be the announcer at the Super Bowl. The same situation presented itself in 2016, as the Denver Broncos played the Carolina Panthers in Super Bowl 50. As voice of NFL events, Roach is heard annually at league events like the NFL Draft, Pro Football Hall of Fame Induction Ceremony, NFL International Series in London, England, Pro Bowl, and when no conflict, the Super Bowl. 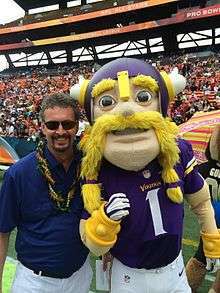 In the summer of 2016, after 16 seasons as the stadium voice for the Denver Broncos, Alan left Broncos Country and returned to his childhood home of Minnesota to announce for the Minnesota Vikings as the team moves to their new home, U.S. Bank Stadium, in August 2016. In addition to sports announcing, Alan Roach is also lent his voice for many voice-over projects, none heard more than his being the voice of the underground train system at Denver International Airport, along with local 9News anchor Adele Arakawa. ↑ "Alan Roach, veteran sports announcer, cut from KOA position – The Denver Post". Retrieved 2016-06-27. ↑ "'Colorado Rrrrrrockies' stadium announcer Roach steps down". ESPN. 2007-02-27. Retrieved 2010-02-22. ↑ "Coors Field announcer Alan Roach steps down from public address duties". Press Release. Colorado Rockies. 2007-02-27. Retrieved 2009-02-22. ↑ Williamson, Bill (2008-03-02). "Bronco's family wants Pats to lose". Denver Post. Retrieved 2009-02-22. ↑ Flynn, Kevin (2007-05-07). "New voices coming for DIA trains". The Rocky Mountain News.